Happy to say our trip is off to a busy, but fantastic start! Unlike our last trip, there were no travel surprises and I landed on time in San Jose. We didn’t plan much time in San Jose in favour of more time in Costa Rica’s national parks, but we did really enjoy our short time there. Since were mostly doing adventure activities in the rest of the country, we opted to learn a bit about Costa Rican history and culture and did a walking tour of San Jose. We spent a fair bit of time exploring San Jose’s many parks. I’m so glad we did the tour on a Saturday because the park was packed with locals and we met some fascinating Tikals and Tikas (the local name for Costa Ricans). 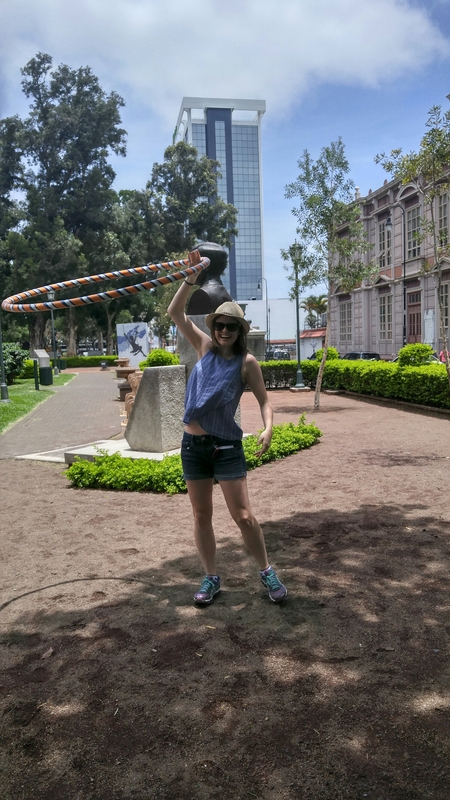 Almost as soon as the tour started, I was excited to notice some people walking around with hula hoops – one of my favourite hobbies! We soon stumbled upon a whole group of hoopers and our guide told us that the city used to run free programs every Saturday in the park. There would be yoga at 8, dance at 9, hooping at 10, etc. Unfortunately the city eventually stopped the program, but the hooping lady loves to hoop so much that she continues to bring hoops to the park every week to teach people to hoop! I was thrilled to join in for a bit and see many of the same tricks I know. At the next park we stumbled across a local festival celebrating entrepreneurship, which had several different exhibitions on. They were showcasing local community initiatives and providing free food and smoothies for the festivities, so we decided to join in! It was great to see so many Costa Ricans interacting together in public spaces on the weekend and it really gave the city a lot more character. 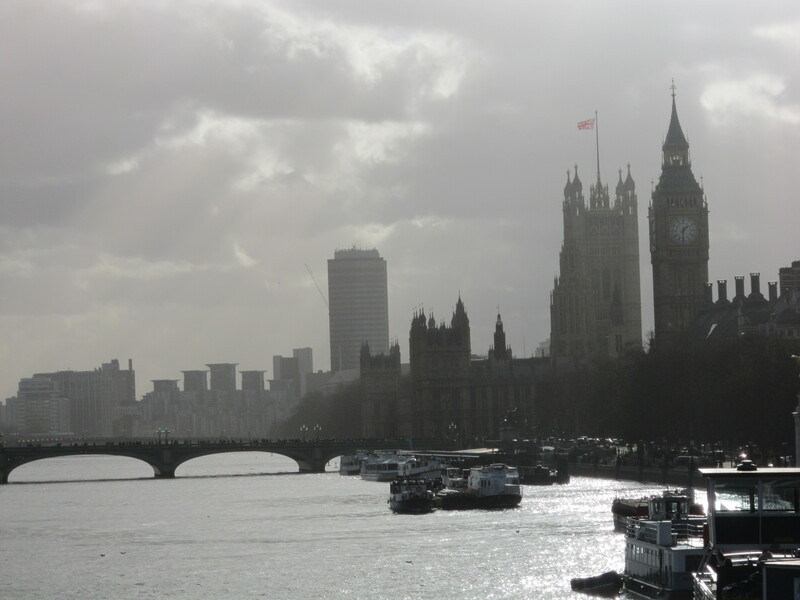 In fact, our guide was fantastic at pointing out some of the interesting (and funny) eccentricities of the city. He showed us a sun dial that reads the wrong time, but instead of fixing the sun dial, the government posted a convoluted table explaining how many minutes to add or subtract from the sun dial based on time of year to get the correct time. He also pointed out a mural of a monkey that was originally painted smoking a cigar, but was modified to be drinking a brain out of a glass with a straw to be less offensive. Funnier still is that the monkey is painted next to a gate that regularly rolls across the graffiti and makes it look like the monkey is behind bars. So our short stop in San Jose ended up being much more exciting than anticipated, except maybe when we almost missed the only bus to Monteverde for the day – but we made it in the end! Monteverde was a totally different scene than San Jose, but we were thrilled to get into nature. 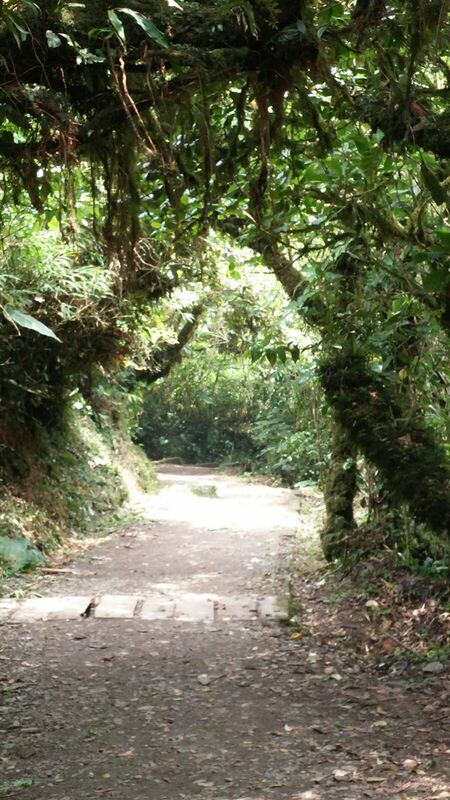 Monteverde is a cloud forest nestled in the highlands of Costa Rica. It’s one of Costa Rica’s top attractions and boasts an impressive amount of wildlife. There are tons of adventure activities – from ziplining, to bungee jumping, and rafting – but we opted to check out the biological reserve instead. The reserve is a protected area with several kilometres of walking trails. It was a cooler morning, so I opted to go for a run after breakfast, along some beautiful mountain views I might add. We thought it was going to be packed at the reserve due to our late start, be we were surprised to find that thanks to the number of trails, the reserve felt virtually empty! We had our first animal encounter only a few hundred meters into the trail when an agouti stumbled on to us as we were putting on bug spray. We mistakenly identified him as a capybara at first, so if you’re wondering what an agouti looks like – now you know. We hiked about 7-8 kilometres of trails in total. 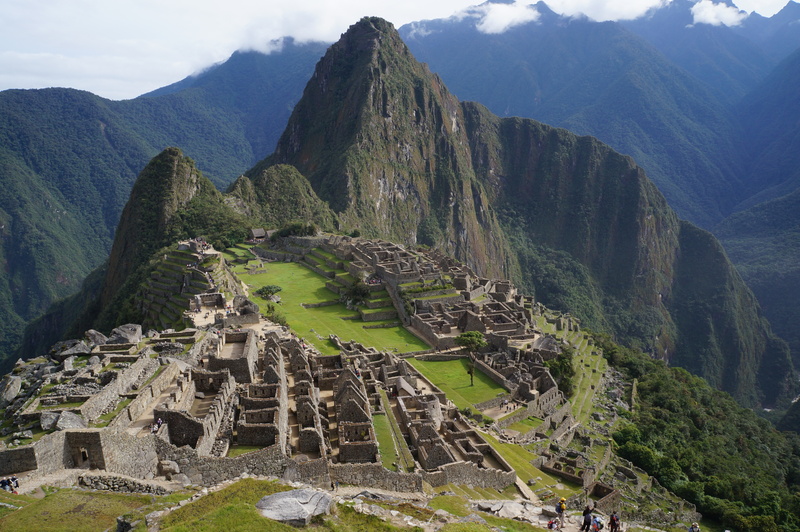 This included hiking up to the most amazing viewpoint. The trees are so tall that you’re under the canopy for most of the trails, but at the viewpoint you can look out over the rolling hills of the reserve for as far as the eye can see! 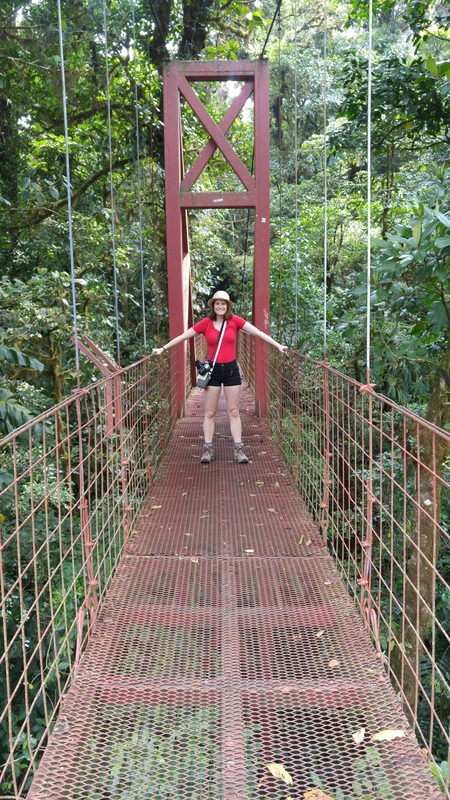 We also hiked out to Monteverde’s famous red suspension bridge and caught a glimpse of a few of the many, but elusive, birds. We could constantly hear the birds up in the canopy, but it was hard to catch a glimpse of them down below. We finished off our time in Monteverde with a night walk in the forest. I was skeptical that we would see much, but most of Costa Rica’s wildlife is nocturnal and boy, did they prove me wrong. Our first sighting was a poisonous tarantula, followed by an armadillo! The armadillo was easily my favourite because I really did not expect to see one. We went on a lengthy search for a sloth and eventually found one hanging out on the road where we had started. Our guide was totally thrilled to discover there were actually 3 sloths in one tree! Sloths are solitary creatures, so you rarely see them together and our guide couldn’t believe to find 3 in the same tree. We also saw a sleeping keel billed toucan, a side stripped palm pitviper, and another sloth, bringing the total up to 4! We really couldn’t believe our good luck and finished our time in Monteverde feeling thoroughly accomplished! Next stop is Arenal Volcano! Glad you’re having a good time! So jealous of your night walk; I’ve never seen a sloth nor an armadillo. Did the guide mention if the sloths were two- or three-toed? Great update! Keep ’em coming. Unlike Seth I would not think to ask any of these questions. I’m just thrilled to read. Sounds adventurous! Jealous! jealous! love reading your blogs and I learn lots from them. Your so informative.bcontinue to have a great trip. Love you both!